OK, I might be hard pressed to come up with the first 311 reasons why I adore the Morikami, but the sentiment remains … the quirky, cultural, natural nature of this place never fails to impress me. Reason #312: Where else in south Florida would you find small, delicate trees abloom with small, delicate cherry blossoms? After a recent, cold snap here that left us all much more appreciative of our normal temperatures, a small group of trees that had been planted as an experiment in the gardens began to color with pink and white cherry blossoms. The winter temperatures compelled them to bloom for the first time in a long while. Short-lived, the temporary phenomenon was captured by local newspapers and photographers. According to the marketing team, some visitors who were compelled by the news coverage to visit were a bit disappointed by how small the 5-foot cherry trees were in actuality. But the loveliness and rarity of the flowers outside of their native Japan couldn’t be denied. After working with and for the Morikami crew for almost 10 years, I really do enjoy the unusual, funny, and completely unique stories that come out of this museum. Memories that linger are the exhibits that featured the varied photographic views of Mt. Fuji in all its majesty and the personal accessories of a real-life geisha; enjoying a banana and cream cheese-filled eggroll (yes, eggroll) topped with whipped cream and raspberry sauce; beating a taiko drum and realizing what sweaty work it is; and seeing how excited a two-year-old can get tossing a fat koi more food than it really needs in a day. I guess those are reasons #214, #45; #12 and #133! Missed the cherry blossoms? Here’s the link to the Palm Beach Post/Sun-Sentinel article — Cherry Blossoms! 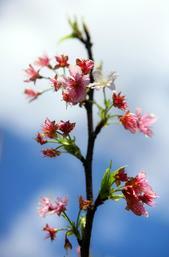 Cherry Blossoms bloom at the Morikami after a recent cold snap.